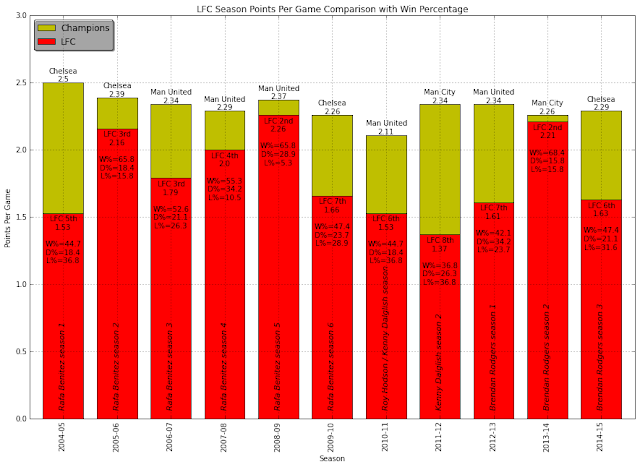 This post describes Liverpool Football Club's premier league performance in seasons 2004-05 to 2014-15 with graphs generated from publicly available data. The seasons cover 11 years, from Rafael Benitez' first match of season 2004-05 in August 2004 to Brendan Rodgers' final match of season 2014-15 in May 2015. Hopefully the graphs and narrative will make you think about the highs and lows. It's hard for any Liverpool fan to look back over these 11 premier league seasons without some trauma. Just think about Istanbul if it get too difficult ;-). The analysis also places Rodgers' performance in context. It remains to be seen if he will survive the run of poor results in the final quarter of 2014-15, culminating in the Stoke debacle. In his final season in 2014-15 Steven Gerrard was Liverpool's top league scorer with 9 goals. This is equal to the lowest ever total by a top scoring Liverpool striker since Liverpool were founded in 1892. Steven joins 2 other top scoring strikers with 9 league goals: Milan Baros in 2004-05 and Jack Cox in 1903-04. Whoever is in charge next season it is clear that Liverpool must do what they should have done in the summer of 2014 following Suarez' departure - take a risk and invest in a quality striker. This article was first published on 26th May 2015. It was also published here on lfchistory.net on 3rd June 2015. A points total of 82 or greater has been sufficient to place Liverpool in the top 3. Benitez achieved the best points total with 86 in 2008-9, finishing 2nd. 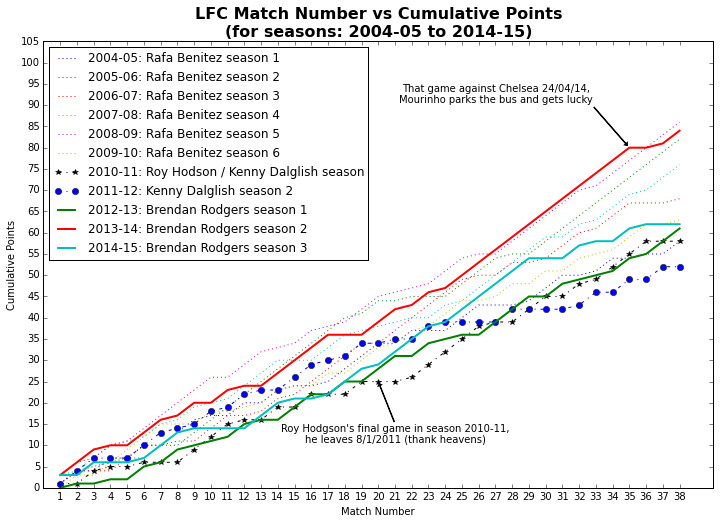 Rodgers was closest to finishing in top spot, finishing 2nd with 84 points in 2013-14. Unfortunately these graphs can only tell part of the story. Rafa's Liverpool showed steady improvement over the 3 seasons from 2006-07 to 2008-09, finishing 3rd, 4th and 2nd - also see the points per game analysis below. The team then fell off a cliff, finishing 7th in 2009-10. 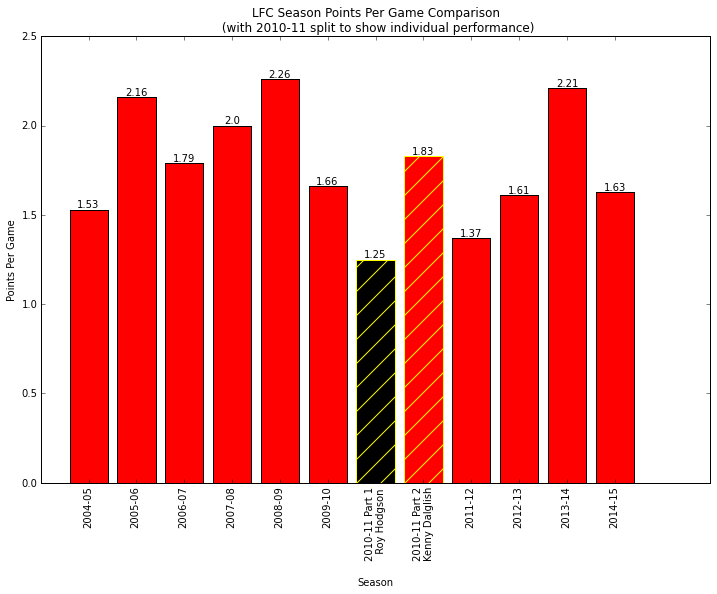 Liverpool's total was 23 points lower in 2009-10, the biggest drop in points over the eleven years. So why the dramatic drop? In my view there is no doubt that Hicks and Gillett's lack of investment had a big impact. Not only did they take the club close to administration, they severely hampered the management of the club, with Rafa bearing the brunt. If Rafa had been backed and allowed to strengthen his squad in the summer of 2009 - in particular to provide cover for Torres - then history may have been very different. In the 11 seasons Liverpool have only once had a striker who has scored more than 25 goals - Luis Suarez in 2013-14. Suarez' partnership with Sturridge was the most prolific, with an outstanding total of 52 goals. And Steven Gerrard chipped in with 13. The Suarez / Sturridge partnership was the (joint) third best league total in Liverpool's history, exceeded only by Billy Liddell / John Evans' 59 in 1954-55 and Roger Hunt / Ian St John's 59 in 1961-62. There is only one other season where the 3 top scorers have all exceeded 10 goals - in 2008-9 Gerrard and Torres produced the second highest partnership total with 30 goals; and Dirk Kuyt chipped in with 12. The second most prolific strike partnership was Torres and Gerrard, exceeding 25 goals in 3 seasons - 2007-08, 2008-09 and 2009-10. Benitez achieved the best defensive performance. In particular in 2005-06 to 2008-9 when the average goals conceded was only ~27 goals. The best was 25 goals against in 2005-06. This was 25 goals better than the 50 conceded by Roger's team in 2013-14. However, 2013-14 was the season with the highest goal difference of 51 goals. Remarkably Steven Gerrard appears in the top 3 strikers list in 9 of the 11 seasons. And top 3 times. Not bad for a mid-fielder! 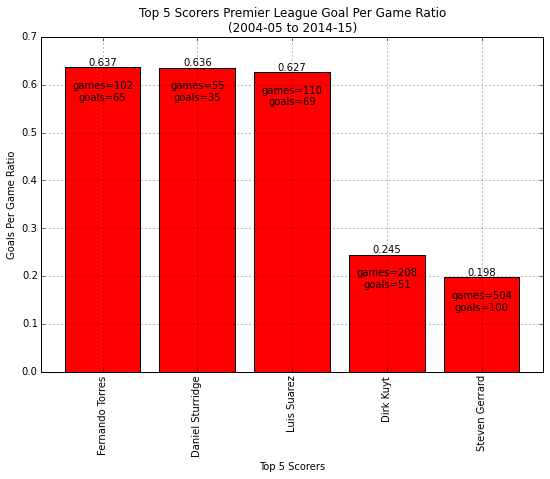 Let's take a closer look at the top 5 premier league scorers from 2004-05 to 2014-15. There is very little between the top 3 scorers' premier league goals per game ratio over the 11 seasons. Fernando Torres is marginally ahead of Daniel Sturridge who is marginally ahead of Luis Suarez. The difference between Torres and Sturridge is ~0.001 goals per game. Torres' scored at a rate of 0.637 goals per game. This means that on average you only had to wait until the 51st minute of the second game for Torres to hit the back of the net. Sturridge scored 12 seconds later. And Suarez scored a fraction over 2 minutes after that. That's some 3 minutes! Dirk Kuyt is 4th and Steven Gerrard is 5th. Kuyt's contribution was significant, with over 50 goals in over 200 appearances. Kuyt finished in the top 3 scorers list in 3 seasons. A great return for another who didn't often play as striker. Steven Gerrard scored most premier league goals over the eleven seasons with 100. Congratulations to Steven on hitting 100 goals in his final game at Stoke. The least said about the Stoke game the better. Steven also has the most appearances of the top 5 scorers with 504. Note that this comparison is a little unfair on Gerrard and Kuyt as the period covers seasons when they were past their prime. And it should be noted that Sturridge has played about half as many games as Suarez and Torres. Liverpool's best points per game (PPG) total was Benitez' 2008-9 team with 2.26. If this PPG had been maintained in 2009-10 or 2010-11 then Liverpool would have equaled or exceeded the points total of the champions. Or, to put it another way, Liverpool would have won the league! Liverpool have finished in the top 4 on all (4) occasions when their PPG has been 2.0 or greater. Combine that PPG with a strike partnership of 30 or more goals and Liverpool have finished 2nd. Liverpool's best win percentage was achieved in 2013-14 with 68.4%, not surprising given the scoring record of Suarez and Sturridge. 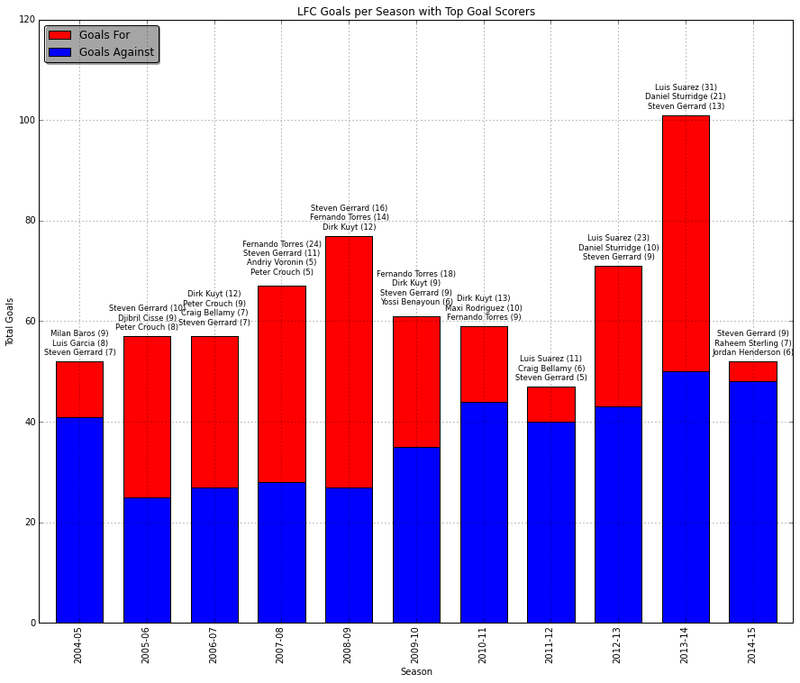 However, this graph doesn't show the trauma that occurred in 2010-11. Let's take a closer look at the PPG in 2010-11. "And don’t be afraid of the dark. At the end of the storm, there’s a golden sky." A Liverpool fan. Now we can see Hodgson's poor performance more clearly. In 2010-11 Hodgson was manager for 20 games with a return of 1.25 points per game. If Hodgson had maintained this form for the whole season Liverpool would have finished with 47 points in 10th place, only 8 points off relegation. If Hodgson had not been pushed out the door there was a real possibility that Liverpool would have gone in to free fall. On 8 January 2011, Liverpool announced that Roy Hodgson had left the club 'by mutual consent', and Kenny Dalglish was appointed as manager until the end of the season. Dalglish was manager for 18 games with a return of 1.83 points per game. If Dalglish had been in charge for the whole season and maintained this form then Liverpool would have finished with 69 points in 4th place, in a champions league play-off position! 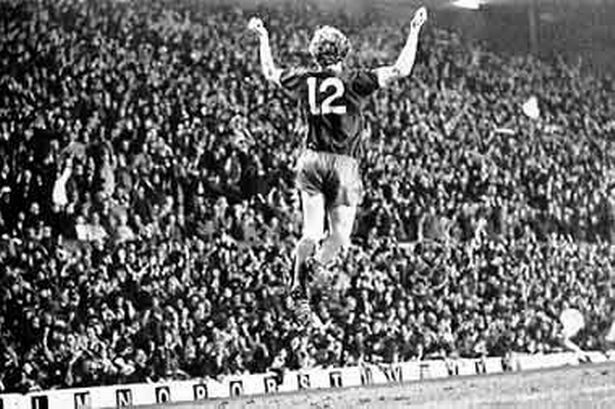 A remarkable turn around, Dalglish steadied the ship and provided a platform for moving forward. 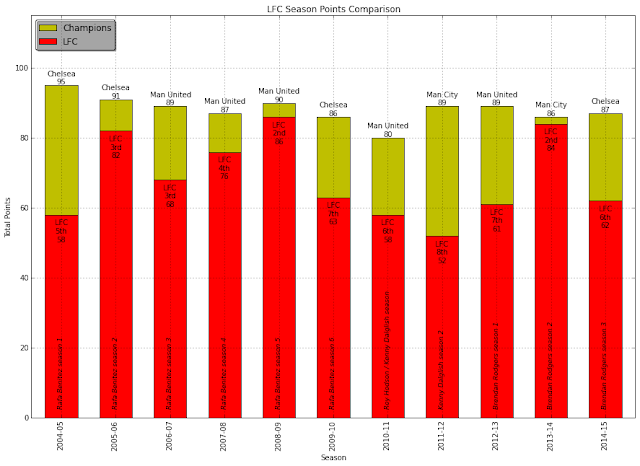 The graph shows the highs and lows over all 11 seasons, that's over 400 matches. The steep straight lines show the unbeaten runs. The best winning run was 11 games in 2013-14. The second best winning run was 10 games in 2005-06. The horizontal lines show the losing runs. The worst losing runs of 3 games occurred in 2011-12 (twice) and 2014-15. 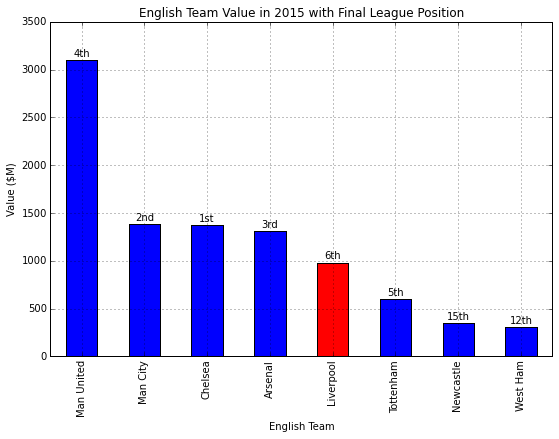 It is clear that Liverpool have under-achieved in 2014-15, finishing in 6th place behind Spurs. For some this graph will say that Liverpool's fate of a 5th place finish is sealed before a ball is kicked. If the richest clubs buy the best manager and players in the world then there is nothing Liverpool can do, right? I don't agree with this pessimistic view. The graph tells me that if Liverpool copy what the others do then winning the league will be a difficult. Liverpool must do something different... building a great academy to attract the best local talent; buying and coaching the best emerging talent from all over the world; finding players who would run through a brick wall for the manager; the application of innovative tactics; and the ability to buy and integrate quality players who are in or very close to their prime. Brendan Rodgers has shown that he can get the best out of a world class talent, such as Suarez. And that he can improve some of the best emerging talent, such as Coutinho, Sterling (contract aside) and Ibe. However, serious doubts remain about his ability to build a team with the right mentality. The final game against Stoke in 2014-15 did not contain 11 players who were ready to run through a wall and come out fighting for their manager. I've also analysed all 18 of Liverpool's title winning seasons. On average the Liverpool top scorer netted 22 goals. And his partner scored 15 goals, giving a partnership total of 37 goals. Ian Rush scored the most goals in a title winning season with 32 goals in 1983-84. Amazingly Roger Hunt scored 31 goals in Liverpool's 1963-64 title winning team and still didn't finish as top goal scorer in the league; in that year Jimmy Greaves scored 35. 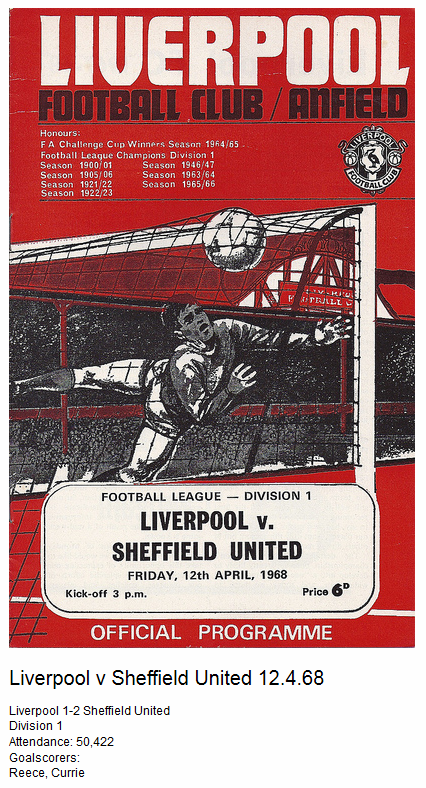 The most prolific title winning partnership was Roger Hunt and Ian St John in 1963-64, scoring 52 goals. The lowest title winning partnership was Keegan and Toshack in 1976-77, scoring 22 goals. The top strike partnerships of the 11 title winning teams in the 1970s and 1980s are legends: Toshack and Keegan (three times); Dalglish and Johnson (twice); Rush and McDermott; Rush and Dalglish; Rush and Dalglish / Souness; Rush and Molby; Aldridge and Beardsley / Barnes; Barnes and Rush. Although both Rafa Benitez's high in 2008-9 and Brendan Roger's high in 2013-14 fell short of the ultimate goal, they were great journeys. The Gerrard / Torres partnership (30 goals) and the Suarez / Sturridge partnership (52 goals) were first class, and both were in the 22 to 52 partnership range that has won titles for Liverpool. The Sturridge injury in 2014 and the failure to secure a top class strike partner when Suarez departed has been a major contributor to the disappointment in 2014-15. Finishing 6th without an effective striker was an achievement of sorts! In his final season in 2014-15 Steven Gerrard was Liverpool's top league scorer with 9 goals. This is equal to the lowest ever total by a top scoring Liverpool striker since Liverpool were founded in 1892; Steven joins 2 other top scoring strikers with 9 league goals: Milan Baros in 2004-05 and Jack Cox in 1903-04. With Gerrard's departure there is an understandable nervousness. Of course it is not possible to replace Gerrard; he is unique - a local lad who is world class and has lived the dream for 17 years. Nevertheless it is clear that the purchase of a first class striker is essential. History says that to win the league Liverpool need a striker partnership that will score 37 goals on average. Liverpool future success will be shaped by the activities in the transfer market in the summer of 2015. In 1977, Liverpool manager Bob Paisley paid a British transfer record of £440,000 to bring Dalglish to Liverpool. Well actually it was John Smith, an enlightened chairman, who persuaded Celtic to sell. Smith took a risk and backed his manager to buy quality; in doing so he changed the course of Liverpool's history. Special thanks to the providers of the raw data files: english premiership stats, lfchistory.net, and Forbes' list of the most valuable football clubs on wikipedia. The lfchistory.net was also a great source of other historical information and is highly recommended. And thanks of course to the python community who provided the tools that supported this analysis. The analysis uses IPython Notebook, python, pandas and matplotlib to investigate the data sources. Essentially the notebook consists of chunks of python code that reads the data from csv files into pandas dataframes and then 'munges' the data and then plots the results using matplotlib. All of the graphs are generated automatically from the munged data. The notebook contains additional graphs and analysis to that used in this post. You can view the notebook by simply clicking on this lfc notebook link. This runs nbviewer on the notebook. The files are also available for download. The data files are located in the data sub-directory. For a description of the data files see the notebook, lfc.ipynb.